When a restaurant has momentum, boy can it move. Take Ox, an apparently inconspicuous bistro on Belfast’s Oxford Street. Since it opened in March, the place has been the talk of the town. Its balancing act of artistry, ambition and produce has almost single-handedly catapulted Northern Ireland back into the foodie conversation. It’s moving at a breathless clip. Reviews have been off the charts. But crucially, Ox has refused to get giddy. Its food is slow and seasonal, and it knows how to manage expectations. The room, for example, is a pared back mix of industrial chic and Nordic minimalism. Brickwork is painted white; colour reduced to the low glow of bulbs strung from a tall ceiling, to the odd turquoise splash on doors and window frames – and, of course, the food. Tables and floors are a simple, earthy wood. Bread comes in little hessian sacks; menus on recycled paper. Apparently, the premises used to be a tile shop. You may deem it style over substance (The Observer’s Jay Rayner said it “appears to have taken its design cues from a hyper-efficient car workshop in Dusseldorf”), but Ox understands the warmer elements of a restaurant too. There’s a wide-open kitchen. Chefs deliver their dishes to the table. Staff wear long, reassuring aprons and strike just the right balance of professionalism and friendliness. They are always welcoming, never intimidating, sharing well-judged titbits that add immeasurably to the meal. There’s a special on our visit, for example – a sea urchin starter served in its shell with celeriac cut into long, tagliatelle-like strips and topped with truffle shavings. It’s a flavoursome mix of earth and sea, but what makes it memorable is the host’s revelation that the urchin was plucked by a diver from Strangford Lough. The intrepid fisherman has even been known to arrive into the restaurant in the middle of service, carrying a box of lobster and other goodies under his arm. Diners are offered a choice of three menus – a lunch option pricing mains at £10/€12, an a la carte with mains from £16.50/€19.75 to £22/€26.30, or an autumn tasting menu at £40/€48, or £70/€84 with paired wines from a first-class list highlighting “artisan wines from interesting places”. 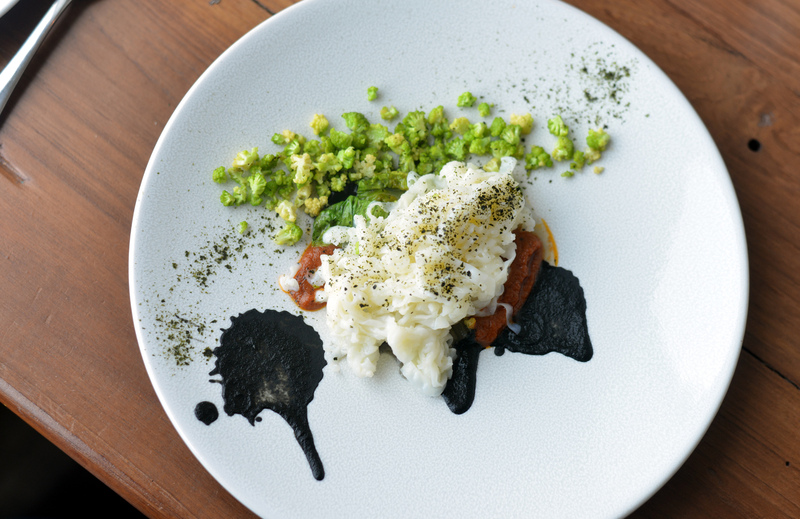 Of the starters, a plate of squid and oyster is a beautiful arrangement of pasta-like squid, blotches of ink, crumbled Romanesco broccoli and a sparing blush of chorizo whose sweetness lifts it off the plate (pictured, above). A medley of Glenarm salmon with fermented cucumber, buttermilk and horseradish looks like something Jackson Pollock might throw together in the kitchen. There’s awesome value in the Lough Neagh Perch too, served on a bed of white beans, mussels and Romanesco for just £3. That’s roughly what you’d pay for a cappuccino in Dublin. 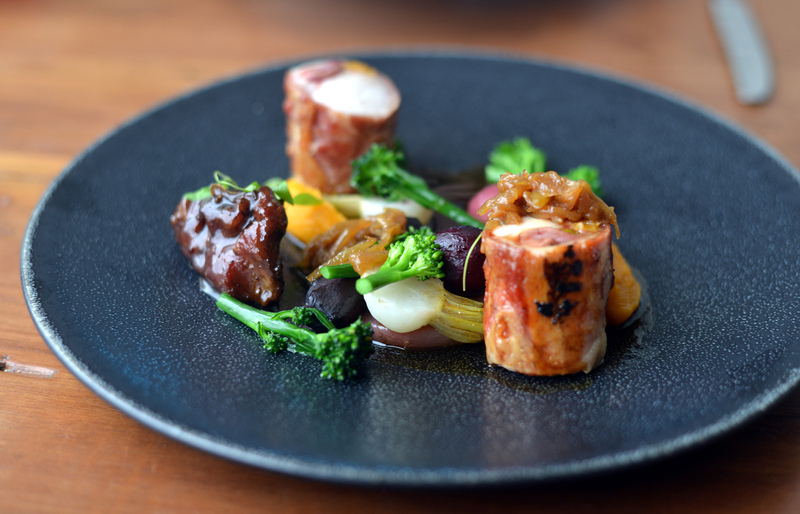 My main pairs rabbit saddle with braised pork cheek, an autumnal medley of comfort fare artfully arranged with beautifully treated snippets of beetroot, carrot and broccoli (pictured, below). The pork is braised to sticky deliciousness; the rabbit wrapped tightly around a stuffing of apricot and pistachio nuts. Other options include pigeon, chateaubriand and a vegetarian mix of butternut squash, ricotta gnocchi and roasted fennel. Brill with carrot and scallop (also fished out of the Lough by our diver friend) is served with seaweed and shellfish butter, and also excellently rendered. I like that Ox aims high without getting on a high horse. “Dining with seasonal creativity” is the mission of Stephen Toman (formerly of James Street South) and Alain Kerloc’h (onetime manager and sommelier at Deane’s), and they’ve delivered on that with a package of poetic food, a modish room and invested service which puts us completely at our ease (and we brought the kids). It’s not the Second Coming. It’s not as earth-shattering a restaurant as Belfast may believe. But Ox is the bright new hope the city needed to bump it up a level. Galway’s Aniar is the closest comparison I can think of – it’s the catalyst turning Beflast from a collection of one-offs like Shu, Mourne Seafood, James Street South and Deane’s into a bona fide foodie town. 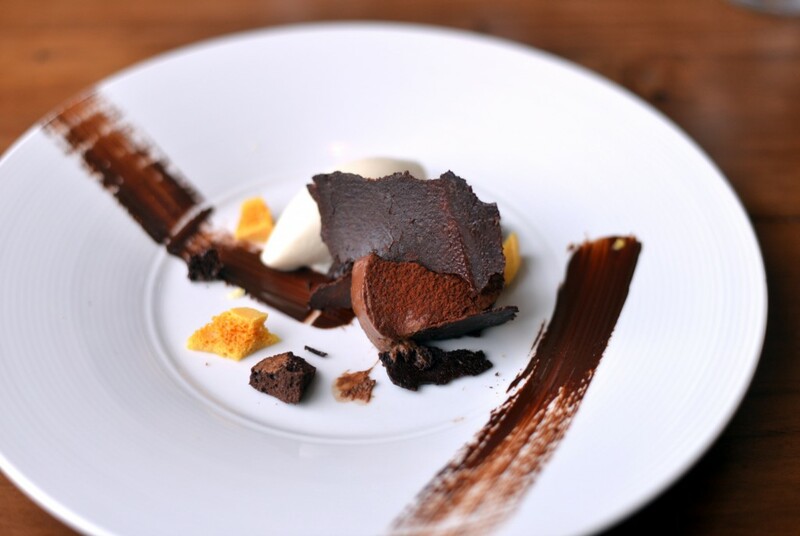 Desserts include a sweet crumble of Kemp apple, blackberry, beurre noisette and cider sorbet (very moreish), as well as a 70% Valrhona chocolate dish with banana and burnt milk ice-cream (stunning to look at, though extremely rich). Cheeses are priced at £2.25/€2.70 each. Momentum is a hell of a thing. Let’s see what Michelin thinks. Dinner for two adults and two children came to £93/€111. Tip extra. 1 Oxford St, Belfast; +44 28 9031 4121; oxbelfast.com. Review Ox Belfast originally ran in The Irish Examiner.